The forecast was for rain & clouds, but the Mallorcan weather seemed to have different ideas because it was just a bit cloudy at 09h30, so we set off with the plan to do ~100 km loop south from Port du Pollença through Alcudia before cutting inland towards Petra for lunch and then back through the centre of Mallorca to Port du Pollença. Alcudia never seems very nice, so we used some of the lanes to avoid some of the town. 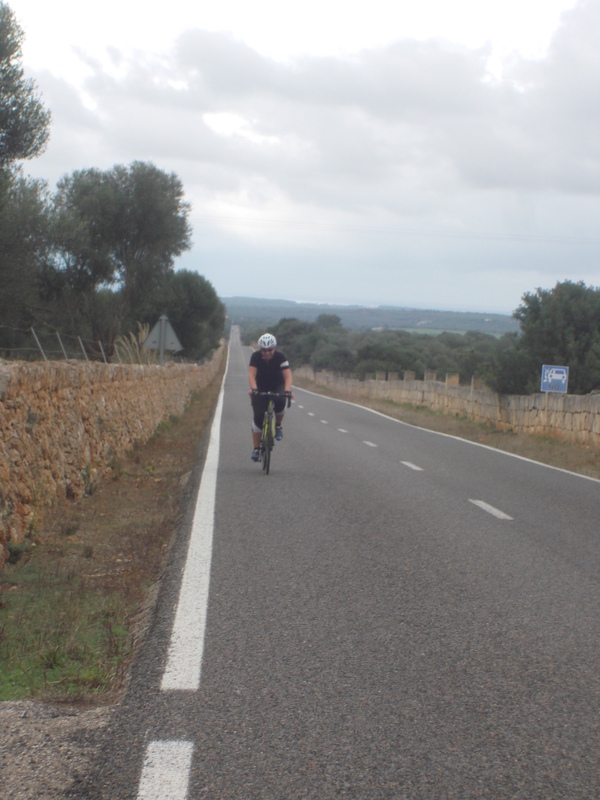 Once south of Alcudia it’s a wide straight road that is an easy, enjoyable, ride. After leaving the main road somewhere south of Can Picafort it’s a slow, gradual climb up a very straight road to nearly 200m before a swooping descent to Petra for lunch. The main square in Petra has a number of cafes and it’s a great place to sit for a rest. And everything seems very good value, although that is probably because we are comparing lunch prices with mountain restaurants in French ski resorts. Since we were last in Petra two years ago a German owned shop has appeared selling various cycle clothing including Rapha. After Petra we headed back towards Port du Pollença. We were being chased by rain clouds, which briefly caught us but they never did any really damage. The views of the Tramuntana mountains were stunning. We forgot to bring Philippa’s saddle with us from the UK and the saddle on her bike is not designed for females, but she was still able to smile (or grimace? ).